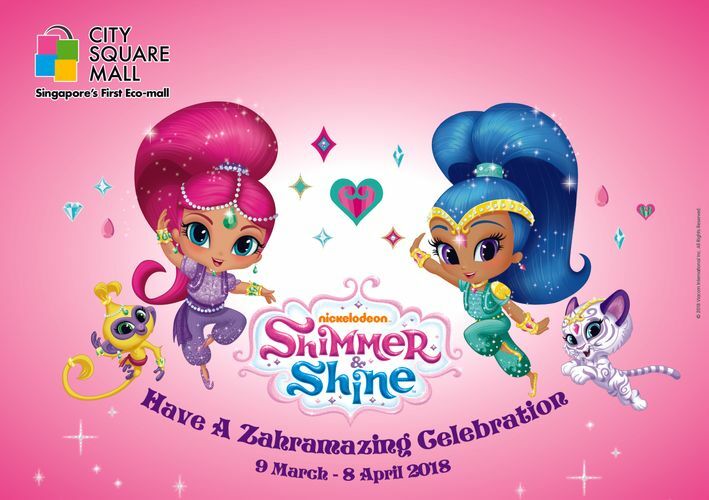 Have a fun-filled school holiday at City Square Mall with Nickelodeon’s twin genies-in-training, Shimmer & Shine! There will be a line-up of Zahramazing activities filled with magic and entertainment for all! Be dazzled with a ‘Live’ Musical show, the first ever Glitter Party and Sparkling Rewards for everyone. Put on your dancing shoes and get ready for a sing-along with Shimmer & Shine as they sing and dance in a ‘Live’ Musical show. For a photograph with your favourite twin genies-in-training, simply spend a minimum of $50* to redeem a Meet & Greet pass, one hour prior to each session. Passes are limited to the first 50 shoppers per session, so hurry before they’re gone! It’ll be a party like no other at Shimmer & Shine’s FIRST EVER Glitter Party! All young genies-in-training will get to enjoy sweet treats, mingle and play fun games with the twins. With a minimum spend of $80*, shoppers can redeem a Party Pass for children aged 3-12 and they will get to bring home a dazzling friendship bracelet and a goodie bag. Redemption starts from 9-18 March, valid with 3 same-day combined receipts, and is limited to the first 100 passes per session – be sure not to miss this! Shoppers can also look forward to Zahramazing treats from the sure-win spin, with a minimum spend of $150* ($250* if inclusive of NTUC FairPrice receipts). Stand a chance to win an exclusive Shimmer & Shine Magical Book of Wishes, $5 shopping voucher and more! So make a wish, and spin away! Limited to the first 5,000 redemptions only. Promotion is valid from 9 March to 8 April 2018. *While stocks last, other T&Cs apply.